It seems everyone is getting ready for Advent and I feel overwhelmingly a little behind thanks in part to very uncooperative weather and appliances. Outside is just now starting to feel like fall to us while most of you are moving onto winter already. This weekend was supposed to be the weekend we did some serious season shifting and then... our washer died. It's not even 6 months old. I will rant more about that later depending on what the service guy says. Anyway, the only reason I have this post done in time for Advent is that I wrote it last year and never published it. So, if you are also feeling a little behind, please don't think I am amazingly ahead of the game and please don't mind the dust... This is an easy craft to do that I wanted to share because there might be others in the situation that necessitated it's invention. It's not much really, but several years ago, when my grandmother was in a nursing home after suffering a stroke a few days before Thanksgiving, my mother told me that she wanted to find some Christmas decorations to cheer up her room. Now, nursing homes have very strict rules about what can and cannot be kept in a patient's room and an open flame would have been a big no-no. 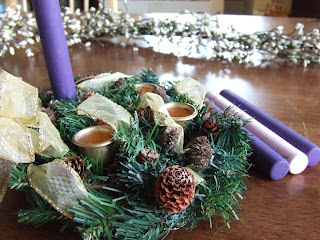 So, I made her this flameless Advent wreath out of a simple little pre-made wreath I found at the craft store, some extra gold ribbon and a 3/4" diameter dowel cut into 5 inch sections. I painted them the appropriate colors and put a little piece of tin foil inside the candle holders so they would be good and snug. My mom added a dowel each week she went to visit. Grandma passed away on December 29th that year. That was her last Advent here on earth. I hope my little decoration helped her enjoy it. This makes a great no-flame wreath for small children, but also would be suitable for someone in a nursing home or assisted living center. I have given this one to my children to "play" with. They liked it much better than one we use to have. (The candles never quite stayed up.) I'm sure Grandma wouldn't mind. What a beautiful story for Advent!! It brought tears to my eyes, how very special! This is a great idea - we have a felt one, but wooden would stand better. I also love that this is a post that has been sitting since last year - I have a few of those, too - you give me incentive to finish them and look ahead of the games as well - ha ha.